G is for Greek life- and I don't mean the fratty kind. 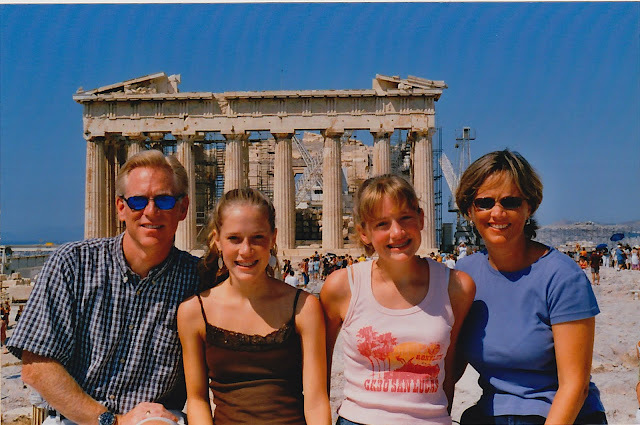 In the summer of 2005 my family took a trip to Athens, Greece. We were greeted with a tray of sticky sweet baklava in our hotel room and it set the tone for a week of feeling truly spoiled. For the most part our time was spent right here, by this pool, with that view of the Sea. 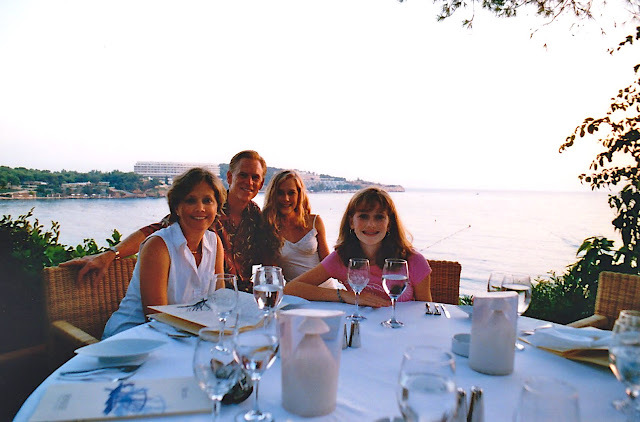 Most days we'd have lunch by the pool, which was filled salt water- something you quickly learned the first time you jumped in and swallowed a bit. We would eat popsicles and read books and soak in all that Vitamin D we were missing out on back in grey rainy England. 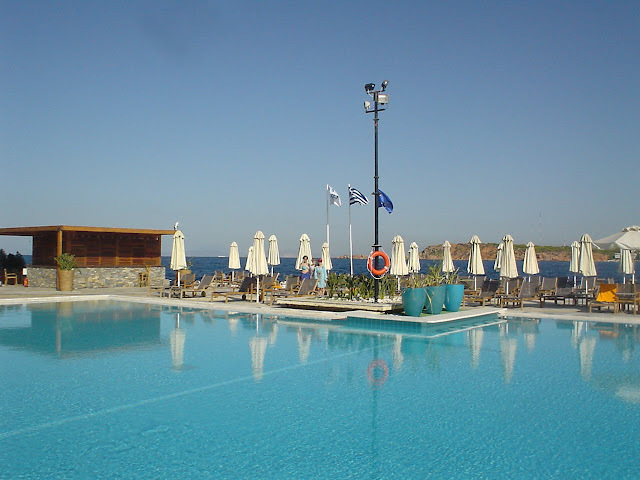 The Aegean Sea butted up right against the pool deck. You could dip your feet in or go diving for sea urchins in the same body of water that was once long ago filled with the warring ships, fighting over a woman named Helen. 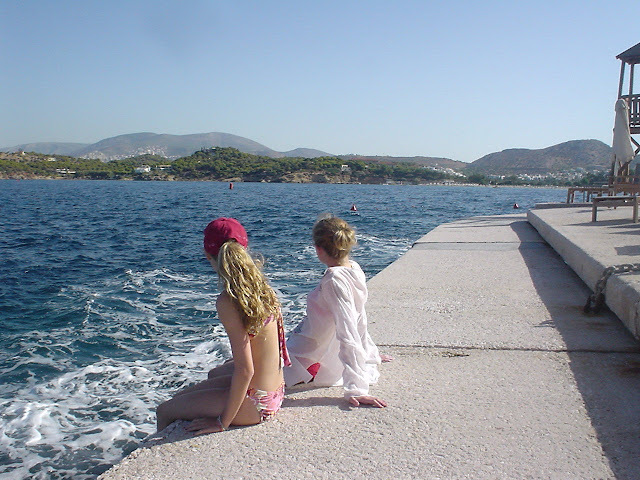 Epic poetry was written about this sea, and the Olympian gods that had dominion over it. In the evenings we'd head out to enjoy dinners under the sky. Real "Greek" salads, stuffed grape leaves, fresh fish and squid caught right there by the restaurant. We didn't just get tan by the pool, and we didn't just venture out of the resort for food. 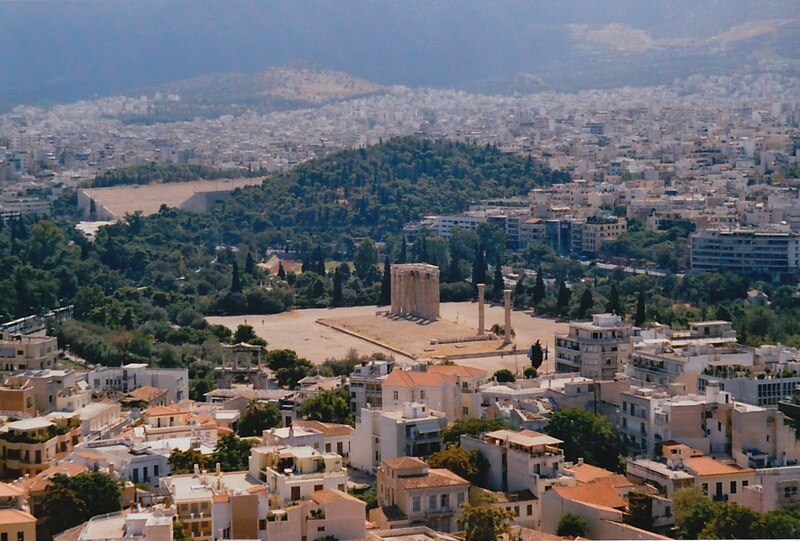 Maybe the coolest part about Athens is that aside from the beautiful coast there is a huge city. And in the center of this bustling and modern city there are these structures that stand out and don't fit in. And they have dates like 520 BC and 132 AD- the date construction was started on the Temple of Olympian Zeus, and the date it was formally dedicated. And of course we visited the Parthenon which sits high up on the acropolis and is dedicated to the goddess Athena. It was quite the hike up there and about 100 degrees but definitely worth the trek. FYI don't try to take any of the rocks lying round up there. Some of them are from 447 BC and the city doesn't like people pocketing them. That same day we sweated it out in the first Olympic stadium. 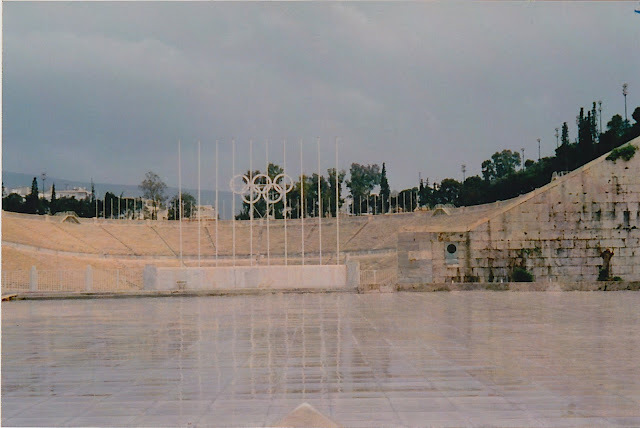 In 1886 the first "modern" Olympics was hosted in this entirely marble arena. It was constructed from the remains of an ancient Greek stadium and used to have wooden seating. It also hosted the 2008 MTV Greece launch party... boy how things change. It looks so lovely!!!! I've never been to Greece but it would be interesting to see it some time. thanks for posting- I have always wanted to visit greece. how beautiful! Wow, that looks absolutely stunning. I have to visit Greece sometime! Beautiful! I posted about Greece today also. When you've been there, it stays in your heart forever. Beautiful pictures! With great respect! A. This looks gorgeous.. I guess I'll have to add Greece to my list of places to visit in the future... Funny how that list never gets any shorter and only seems to keep going! Well when you put it that way... I guess I'll have to visit Greece one day! The history alone is worth it, but to see the sea look so beautiful... funny how my list of places to visit one day never seems to shrink! Weird how that list just grows and grows. Reading everyone's travel posts (and Pinterest) definitely doesn't help. Thanks for the sweet comments! 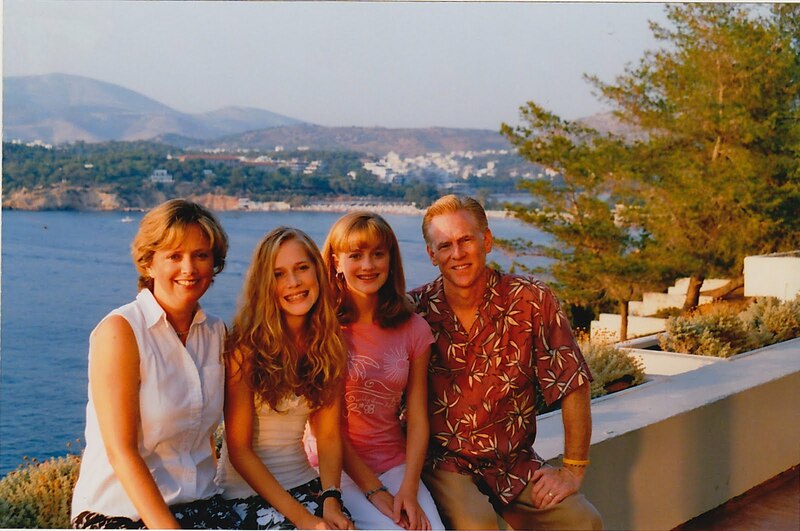 One place I'm bummed we didn't make it too....many after paying for our daughters college tuition...and before we have a wedding to pay for.....awesome pictures....what a life of travel you all had. Great photos. I also follow your mum's blog.